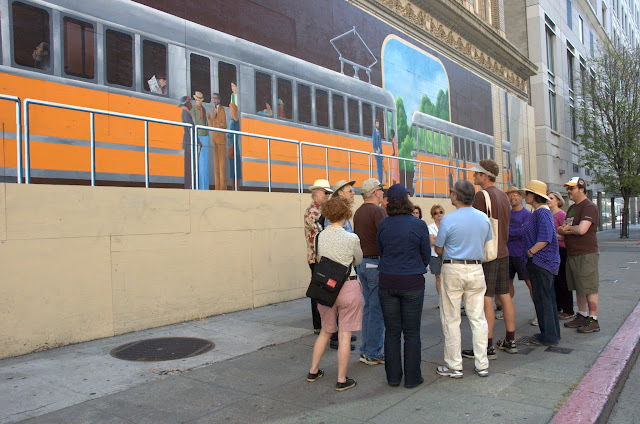 Sunday, 22 people gathered for a special Oakland Urban Paths walk to honor the work of writer, activist and urban planner Jane Jacobs. The walk was the flattest OUP walk I’ve been on, with only one stairway and a gentle grade down to Lake Merritt. But it was a great walk as we hooked up with the people behind three very interesting art and history projects around Oakland, and we couldn’t have asked for better weather. The group met in front of the mural on the Key System headquarters building on 11th Street near Broadway. Many of the stairs and paths in Oakland were built to connect people in different neighborhoods to the Key System, so it was an appropriate starting point. First we heard about the 10,000 Steps project which explores Oakland’s historic parks and marks points of interest around downtown Oakland. There’s an accompanying audio tour, with interviews of different people in the neighborhoods and explanations by local historians. 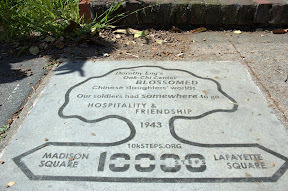 Artists Sue Mark and Bruce Douglas researched Oakland history, interviewed people, and spent countless hours designing and placing fifty sidewalk markers around the 5 remaining parks from the 1800s. While 2 of the original 7 parks are gone, many of the historical points of interest are still around, and the husband and wife team captured stories of people who know and lived the history of those areas. If you listen to the oral history for that marker, Dorothy Eng and Beatrice Wong talk about Chinese American soldiers coming home on leave from WWII and having no place to go—they weren’t welcome at the USO. Eng, Wong and others formed the Chinese Young Women’s Society, and made their own version of the USO there. We also learned from Sue that the bricks for the Hong Lok center came from an older iteration of Oakland High School which were repurposed for the building that was used as the clubhouse. Given the limited space for text in each 10,000 Steps marker, the text is frequently like a haiku, expressing a complex idea in a few words. Others, like the marker outside the Oakland Museum of California have one word: transform. But reflecting the history of Oakland, ‘transform’ is written in Ohlone, Spanish, English and Chinese. Although the markers are numbered, the tour is designed so that you can do all of it or part of it or just one. From the OMCA, we walked the short distance past Camron-Stanford House to Lake Merritt. There we met with Scott Oliver, the lead artist of the Once Upon A Time, Happily Ever After project. 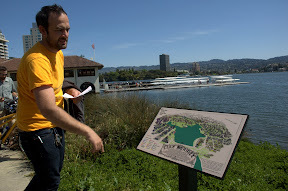 The project is centered on Lake Merritt and title phrase comes from the sign outside Children’s Fairyland. It’s a three-part project: audio tour, interpretive signs, and Lake Merritt souvenirs created by local students and artists. There are four interpretive signs around the lake. The sign between Camron-Stanford House and the Lake Chalet shows points of interest around the lake, and labels the various neighborhoods. Another sign explores the watershed, showing the depths of the lake and indicating where storm drains feed in to the lake. As part of the project, 62 markers were embedded in the walkway around the lake showing the location of the drains. Another component is Lake Merritt souvenirs created by local students and artists. Scott was sporting a t-shirt that combines drawings by different students of the iconic lampposts around the lake. That shirt and other items are available from the Once Upon A Time web store. The third component of the project is an audio tour. The tour begins at the Rotary Nature Center. On the audio tour you’ll hear from supervising naturalist Stephanie Benevidez. She started there as an animal keeper in 1974 taking care of the center’s small zoo, which included wolves, raccoon dogs (from Oakland’s sister city, Fukuoka, Japan), porcupine, skunk, and a number of birds. These days all the live animals are outside, and Stephanie is the last full-time employee, but the mission of the nature center hasn’t changed. You’ll hear more about the goals at the second stop near the five islands that provide a safe roosting spot for hundreds of birds. After a brisk walk around the south end of the lake, we stopped at our final point (and #5 on the Once Upon a Time audio tour), the Cleveland Cascade. There we heard from Jim Ratliff and Barbara Newcombe of the Friends of the Cleveland Cascade about the re-discovery of the cascade and the plans to restore it. Based on photos from the 1930s, it was originally an amazing structure. 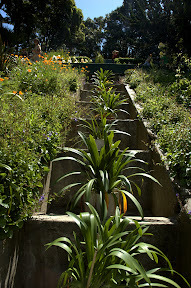 Designed by landscape architect Howard Gilkey, it had 3 levels of 7 steps each. Each step had a bowl that made a curved sheet of pouring water. At each side were shell-shaped brackets, behind which were lights running through the colors of the rainbow. By the 1950s, the cascade had fallen into disrepair. Some time after that it was buried completely. In 2004, a group worked to clean up the park which was then full of nasty stuff, as Barabra said. Jim and others worked to uncover the pools of the cascade. Since then, the park has been restored, and become one of the busiest little parks in Oakland. The Friends of the Cleveland Cascade has raised funds and replicated the bowls and shells, and are now trying to raise additional money to install plumbing and lighting and fully restore the cascade. As a step towards that, they had LED lighting installed under the handrails which helps illuminate the steps. That’s been in place for only a short while, but I’m looking forward to seeing it. That was the end of the directed part of the tour, and people returned to our starting point by various routes. Thanks to everyone who turned out for the walk. Special thanks to Paul for leading the walk, and to Sue, Bruce, Scott, Jim and Barbara for sharing about their various projects. And thanks to Annalee Allen who publicized the event in a recent column. Sorry I couldn’t make it to your Jane’s Walk in the afternoon! All the walkers we saw with CEID t-shirts were part of a walk-a-thon for the Center for Early Intervention on Deafness.